The sunspot (called Active Region 12192 or AR 2192) shot off four powerful flares in four days recently, with many more smaller flares sprinkled in as well. The sunspot region was about the size of the planet Jupiter and is the largest solar flare observed in 24 years. AR 2192 was actually one of the biggest observed sunspots of all time, ranking 33rd largest of 32,908 active regions since 1874, according to NASA scientists C. Alex Young and Dean Pesnell. But how does a sunspot grow this big? "The simple answer is we really don't know," Young told reporters. "Being close to solar maximum [the peak in the sun's 11-year solar cycle] means there is more concentrated magnetic field and magnetic energy under the solar surface waiting to bubble up, but the question of why it comes up as one spot instead of two or more is really still unknown, a mystery." "I guess a good analogy is when you twist a rubber band or piece of string," Young added. "Why do, say, three knots or bunches form instead of two or four?" "The physics is probably too complicated for us at this point but we can get a handle on, say, when the knots will start to form once we better understand the properties of the rubber band or string and how much twist we put into them. We are not to that point with the sun but we may get there eventually." The largest sunspot since November 1990 is seen traveling across the front of the sun in these images from NASA's SDO, captured Oct. 17-Oct 29, 2014. Sunspots are active areas on the sun. They generally form when magnetic field lines are warped, and if they become twisted. Part of it may break out, and show up on the face of the star. Sunspots look dark because they are cooler than the area surrounding them. This sunspot is particularly special because of the somewhat strange way scientists have seen it behave. Instead of shooting out huge bursts of plasma, called coronal mass ejections (CMEs), with powerful flares, the giant sunspot hasn't produced significant CMEs during its time rotating in view of Earth, according to Young. 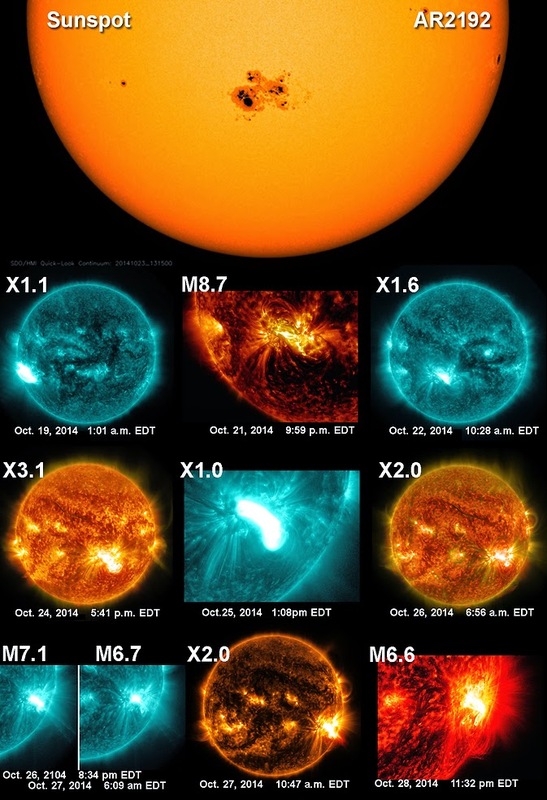 "What's really curious about it [the large sunspot] is that it's produced so many flares of pretty good size, but little or no coronal mass ejections," Young said. "It's not that it's never happened before, but it tends to be the case that when you have a big flare, you generally get a big CME." Earth-directed CMEs are responsible for geomagnetic storms that can harm satellites in orbit or even knock out power grids on the planet. A CME produced by a sunspot larger than AR 2192 knocked out the power in Quebec, Canada, in 1989, Young said.